This quote is taken from a letter to the Colonial Office in the UK. The lines are important for several reasons. Firstly, it proves beyond a shadow of a doubt that the British were bringing in Malabars (Tamils) from the Indian coastal areas to Sri Lanka and settling these Malabars with the explicit intent to change the demography of Sri Lanka. This constitutes the Malabar colonization of Sri Lanka. Secondly, it also showcases that Indians were initially imported from India to Jaffna and having succeeded with the plan the colonial’s next move was to colonize the East. Settlement’s” indicate not just one or two Indians but virtually entire villages were created artificially by importing Indians to Sri Lanka. Thus the colonials colonized the North, the East and Sri Lanka’s Central Province with Malabar Indians. It is the descendants of these Malabars that are now demanding homelands in Sri Lanka. By virtue of the colonial record itself the claim for self-determination should be nullified and the bogus claims need to immediately stop while the International Community in particular Britain should own up to its crimes without helping to fan further chaos. British leader David Cameron & Opposition Leader Jeremy Corbyn please take note. Exactly which period is the TNA using to claim ‘Tamil homeland’ /self-determination/self-rule/autonomy etc if Sinhalese were living in the North before them? Mudaliyar C. Rasanayagam (Tamil) in his book Ancient Jaffna in 1926 says ” Jaffna was occupied by the Sinhalese earlier than by the Tamils is seen not only in the place names of Jaffna but also in some habits and customs of the people” (p.384). A few pages earlier he admits that the population of Jaffna from the earliest times was one of Sinhala speaking people. It became a Tamil one only after the Sinhala people living there had been wiped out in the middle of the 16th century. This tallies with Dr. Karthiegesu Indrapala in his doctoral thesis who writes that Tamil settlements existed only after the 13th century. While Prof. K.M. 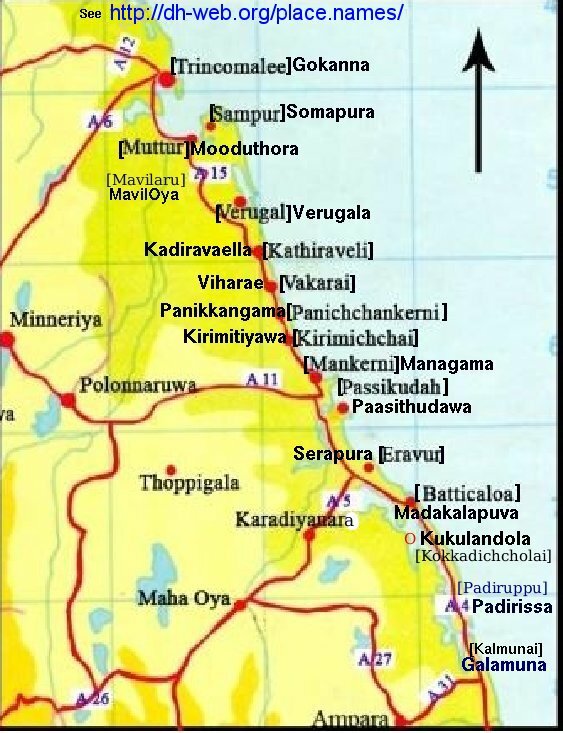 de Silva in his book “Myth of the Tamil Homelands” writes that even between 10-15th century AD Sinhalese settlements were strong in the North “In the early days when Buddhism flourished in North Ceylon, the outlying islands off the coast of Jaffna contained important monasteries and viharas”. The Portuguese arrived in 1505 and Portuguese historian Fr. F. Queyroz writes On the arrival of’ the Portuguese that Jaffna was one of the fifteen sub-kingdoms under the King of Kotte who was therefore, known as the Emperor of Ceylon” (Queyroz: The Conquest of Ceylon, p.32). Let us not forget that Mudaliyar Atapattu was sent to Jaffna to quell the Portuguese attack by the Sinhala King because Jaffna was part of his empire. Queyroz states about the Jaffnapatana It remained under the Portugezen sway for upwards of 40 years, wrested from the Emperor by Philippo d’Olivero when he defeated the Cingalezen forces near Achiavelli (Achuvely) by the great pagoda”. This clearly dispels the notion of a separate independent Tamil kingdom existing. The report to UNESCO in July 1983 by UNP MP Cyril Mathew giving a list of Buddhist temples, monasteries and other ancient remains that date to 2nd century BC. It was only following the Chola invasions from India after 13th century to lead to Aryacakravartis rule that the Sinhalese were forced to move southwards for safety and this is a key reason to oppose the Indian push for a rail/road and ETCA agreement for it would lead to the full Indian colonization of Sri Lanka where currently a Malabar colonization is taking place. The works of many other foreign and local historians suffice to nullify homeland claims when it is very clear that the Sinhalese were living in the North and remnants of Sinhalese Buddhist existence prevail whereas there is nothing to showcase in terms of architecture of indigenous Tamil sites apart from the Malabars that were brought in or migrated from India over periods of time. We can see the man-made reservoirs, the structural sites, artefacts of Sinhala rule throughout Sri Lanka, if such Tamil civilization existed there should be remains at least. Even after Indian, colonial invasions and the manner these invaders destroyed Buddhist sites a significant number of Sinhala Buddhist artefacts and statues still remain from which we can deduce the colossal number that would have existed before invaders landed. Viscount Torrington arrived in Colombo in May 1847 and immediately increased taxes that resulted in mass protests. To quell this he brought in Malabar troops from Madras and martial law was introduced for 6 weeks. His tyranny was such that he was known as the British hyena which subjected him to an ignominious recall from Ceylon which almost led to the Whigs losing office in 1850. Did these Malabars’s return to India? Maybe not! Let us also not forget the Butcher of Uva-Wellassa – Robert Brownrigg. The British are fine gentlemen they say but Brownrigg was to declare to Maj. Gen. Hay MacDowell in 1818 Slaughter every man, woman, and child (including babes suckling at the breast)”. This led to Uva-Wellassa the granary of the Kingdom of Kandy in a state of famine and starvation. Herbert White, a British Government Agent in the (Compendium of Uva) Journal reads as follows there is no record of the population of Uva after the rebellion. No record is left about Uva before the rebellion. If thousands died in the battle field they were all brave fighters. If 4/5 of the remaining population after the rebellion is considered as children and the old, the damage done is unlimited’. Just 3 years after the signing of the Kandyan Convention the British went on a murderous rampage using Malabar Tamils brought in from India – did these Malabars return. Maybe not!. How did the colonials settle the Malabars that they brought? They did so by the enactment of waste land laws making Kandyan peasants landless so that colonials could grow coffee and tea. In 1840 the Crown Lands Ordinance Act (Waste Lands Ordinance) was passed taking all forest, waste, unoccupied or uncultivated land under the Crown. Kandyan resistances was crushed using methods that would constitute genocide and crimes against humanity. Road & rail facilities were created not to benefit the locals but for easy transport for the British. Land grants were given only to loyal native chiefs (in other words anyone who would betray their own people). Indian Tamil Malabars were brought in from India because they afforded cheap labor. ECTA is aspiring to do the same. By 1948 at the time of Sri Lanka’s independence thanks to British Malabar colonization there were close to 1million Indian non-citizens in Sri Lanka. These were not Ceylon Tamils after the term was coined in 1911. These were Indians who were residing in Ceylon on Temporary Resident Permits (TRPs). When some Tamils try to fool the world that citizenship was denied what they are not admitting is that there was no requirement to grant people who were not Sri Lankan citizens of Sri Lanka. However, the Ceylon Citizenship Act of 1948 did allow Indians who were born in Ceylon prior to November 1949 to a father born in Ceylon the right to citizenship. 145,000 Indian Tamils also gained citizenship from the Indian & Pakistani (Residents) Citizenship Act of 1949 to which G G Ponnambalam leader of All Ceylon Tamil Congress supported. In 1964 and 1974 following negotiations with India further citizenship was given. However, we became saddled with Malabars that the British brought for their own profit. Vaddukodai Resolution of the TULF in 1976 speaks of ‘Tamils in possession of northern and eastern districts from the dawn of history’ which itself is a lie since there was no separate Tamil kingdom while the East was never part of any Tamil kingdom. East was part of the Kandyan Kingdom. This is proved when on 14 May 1638 Rajasinghe II, King of Kandy proceeded to Batticoloa to sign a treaty with Adam Westerwold of the Dutch Navy sealing an alliance between the Dutch and the Sinhalese against the Portuguese. This was known as the Kandyan Treaty of 1638. It was signed 18 years after Sankili was deposed by the Portuguese and showcases that the King of Kandy was in control of the East. Let us also not forget that when Robert Knox, the Englishmen landed in Trincomalee (East Sri Lanka) in 1659 he was apprehended by the Tambalagama Disawa and produced before the Sinhalese King of Kandy. That Treaties were signed by the Dutch in 1638 and 1776 clearly shows that East was under the Sinhala Kandyan Kingdom. Let us also remind everyone that in was in 1833 through the Colebrooke and Cameron reforms that the British divided then Ceylon into 5 provinces – Northern, Southern, Eastern, Western and Central. Nuwara Kalaviya (present North Central province) was annexed to Northern province while Thamankaduwa (Polonnaruwa) was annexed to Eastern province. In 1899 British increased the provinces to 9. The important fact is that the British demarcations were based on their administrative needs and for revenue making and not based on ethnicity or religious basis and completely ignored the historical realities. No one can use the British demarcations to claim rights based on ethno-religious division that British created. What is interesting is that the Tamil separatists are using the minute by Hugh Cleghorn, British colonial secretary in 1779 as the basis for Tamil Homeland. However, Cleghorn’s famous minute refers to ‘MALABARS’ (there is no mention of Tamils) and given that the British were bringing Malabars from India and settling them in both North and East and Malabars are from India the homeland notion has to get thrown out the window! The cries for self-determination & homelands has provided an excellent opportunity to correct the lies that have been floated over the years by separatist elements. Finally the Sinhalese themselves are beginning to now realize that no part of Sri Lanka can be divided using the homeland tagline as is being done by those drafting the new constitution who are toying with the plan to re-introduce CBK’s 2000 draft constitution with some frills added. This is an excellent time for people to finally acknowledge beyond doubt that Tamils were always known as Malabars coming or brought by colonials from India’s South to Sri Lanka. Colonials settled them in both North and East as evident from colonial records. Artefacts found in every area dug in the North and East are Sinhala Buddhist and nothing else to showcase any other civilizational existence. The destruction of these and construction of kovils, churches and mosques on top of them highlights attempt to hide the true history but requires these sites to be returned to the rightful owners. Viscount Torrington’s letter to the British Colonial Office in 1848 the same year as the famous rebellion highlights how the colonials brought in Malabar foreigners and attempted to change the demography of the country to their advantage. When the British Opposition Leader Jeremy Corbyn calls for self-determination for the very people his ancestors brought from India to Sri Lanka, it exposes the British mischief once again. There can be no new constitution placing a federal set up for self-rule/autonomy for Malabar Tamils based on the lies that have been floated all these years. It will only serve as a hand over of Sri Lanka’s sovereignty to India who have been colonizing Sri Lanka over the years. The language and ethnic element are all part of this gameplan using the 13th amendment /Indo-Lanka Accord/ Indian trade pacts & ETCA. Goebbels has forgotten to tell all those that repeat a lie that even lies can’t counter the truth. හොඳ මිනිසුන් දේසපාලනයට නොපැමිණීම මෙයට හේතුවයි. ගැටඹේ හාමුදුරුවෝ යම් හඬනැගීමක් කරන බව පෙනේ. සංඝයා වහන්සේ නැගී සිටිය යුතුය​. වෙන ක්‍රමයක් නැත​. එහෙත් දුස්සීලයන් දේසපාලකයන් පසුපස පෙල ගැසී එයද විනාශ කරති. Allow me to respectfully disagree with Dham on moral turpitude. At times we have to forego morality of leaders if they are better than the lesser evil on national interest. For instance, prince Gamini went into a Buddhist temple with a blood dripping sword to kill his brother Tissa inside the “budu geya”. Although he was stopped, he waited within the shrine for 4 days to kill. People forgave him in the wider national interest. King Parakramabahu also indulged in mass murder, warfare, women and other pleasures while one of his younger queens is said to have consumed human flesh. People put up with these extreme immoral acts once again for the sake of national security. I’m reluctant to compromise on national security policy of politicians (no difference between Mahinda and Sirisena on 13A, KP and Wigneswaran – the three threats to national security and corruption) but we must compromise on politicians’ other moral issues. Otherwise we will not have politicians. I agree with “lesser evil” with regard to morality but do not agree with “lesser evil” for the interest of Sinhala people (and for the welfare of general Sri Lankans as long as they want to live in harmony). We can’t find 100% morally correct people – that category is reserved for Arahants. However, between two groups who respect morality and disrespect morality I choose the former. It is impossible for an immoral person work for the welfare of the country compared to a morally better person. Let me ask a simple question. Therefore morality is imperative for a good leader and we must worship the real “Yahapalanaya” . Let me take another example. For instance say Gota arranged to kill Eknaligoda for the sole purpose of National interest. I would say that is not considered immoral ( even though Buddhist pledge not to do it). However if he has killed him for publishing a book against nepotism, then it becomes a crime. Another example is , if Namal has actually arranged to kill Thajudeen because of jealousy or some personal reason I approve giving him maximum punishment regardless of his father’s good deeds. For a leader to be fearless and honestly work for the national interests, he/she shall have a good moral character and to a certain extent. A person who has no money or heart to allow free medicine for the poor but has enough money for his won personal comfort will never work for the country. If this is your position, then we are in agreement in most part. The examples you gave are irrelevant as they are illegal today. It was a different legal regime in the past when kings were all powerful. All crimes must be punished. No one should be spared punishment just because they serve the nation. That’s why I said morality, not illegality. For instance, bombing a school where LTTE trains children in warfare is immoral but not illegal. Imposing taxes on essential medicine is immoral but not illegal. Allowing perks to politicians while people are taxed is immoral but legal (subject to some conditions). I was explaining this same thing in a private forum in relation to the war crimes issue. Morality and legality don’t superimpose which is rather unfortunate for some. Loving the nation is too much to ask from politicians. No politician loves the country. Instead, aligning politicians’ selfish (even immoral yet legal) interests with national interests as much as possible is beneficial. On key national security issues, the “lesser evil” is not sufficient. eg Wickirama singham & wickirama singha are from same family call Hela (in Tamil Eelam) !!! Elra (Ela Raja / Eellalan ) !!! I realised the examples are not really applicable to the main prerequisites. I specially like the idea that politicians shall be “made to work” than to “hope will work” for the betterment of the country. Most politicians do know this in the developed world but in our countries, unfortunately people worship them as they doing a favour to them. It is the same with doctors in our country. People should learn to treat them as workers, not Gods. But loving the nation can be a reality, since we can find so many people having that patriotism and why not the politicians ? It is the pandams and Kade Yannos have created this monster “politician”. Mahatma Gandhi is the most celebrated Indian colonial parasite. Many Sri Lankans are gravely concerned about the TNA proposal to partition Sri Lanka into four pieces with a huge chunk (28% of the land area, 66% of the coastline and 66% of the ocean comprising the North and the East of Sri Lanka) going to the TNA racists and separatists as a merged North East federal state (but craftily disguised as ‘unitary’) with full powers. We are wondering why did over 43,000 both Sri Lankan Forces and civilians die at the hands of the LTTE and that megalomaniac Prabhakaran, if now, the TNA is being handed over an ‘Eelam’ so easily constitutionally? When looking at a GIS Map of Sri Lanka, it is amply clear that most of the forested areas of Sri Lanka are situated in the North and the East. Do not these forests belong to all the citizens of Sri Lanka? Do not the same principle apply to the ocean too or even the whole island, that the oceans and the whole island belong to all the people of Sri Lanka? Mr. Vigneshwaran has ‘created’ a fake history (stating that Tamils lived in Sri Lanka for 2000 years). Yet, there are no ancient ruins in Jaffna, in the North nor any ancient Dravidian writing to prove these fake claims. History of the Tamils commence mainly with the Dutch and the British bringing in large numbers of people from Tamil Nadu to work in tobacco plantations commenced by the Dutch and the British. There was the so called Jaffna Kingdom set up by an invader just prior to that but then Jaffna was only very sparsely populated. Our question is, can people such as Mr. Vigneshwaran ‘create’ his own fake history like this? He is ignoring the many Buddhist ruins, the many ancient Buddha statues, ancient Sinhala prakrit writing, the many ancient irrigation reservoirs built by Sinhala kings in the North and the East which proves an earlier indigenous Sinhala habitation in the North and all over the island. We would like to tell Mr. Vigneshwaran to be objective when it comes to history and archaeology and accept once and for all the fact that the Sinhala people lived all over the island for thousands of years and continue to do so. I would like Mr. Vigneshwaran to note that the provincial boundaries were drawn up by British colonialists for their administrative purposes with no input whatsoever from the Sinhala people and does not tally at all with the earlier history of the island which was unitary in nature. The Kandyan Kingdom (1400AD-1815) comprised almost all of the island inclusive of the East and almost all of the North. The earlier Kingdom of Rajarata (600BC-1400 AD) comprised the North Central, North Western, Northern and Eastern Provinces or the dry zone of Sri Lanka. We are gravely concerned regarding the drawing up of a new constitution where due to the pressure of the TNA, the US, EU, UK, Canada, Norway, Sri Lanka is in grave danger of being divided up on ethnic lines into four, five or even six different pieces. Is this not crazy? The TNA proposals were drawn up by experts which the TNA hired from the UK, Canada, Belgium, Canada, US and the like. Is this not an interference in Sri Lanka’s internal affairs by foreign powers, even to the extent of trying to draw up Sri Lanka’s constitution? Can any organization in Sri Lanka go to the supreme court and stop, once and for all, the merger of the North and the East since it is critical to stop this once and for all? Can any organization in Sri Lanka also go to the supreme court and stop, once and for all the, dividing up of this small island on ethnic or any other lines? The only way to stop this madness is to go to the supreme court and get a verdict which would prohibit the merger of any provinces and to stop once and for all the dismemberment of this small island on ethnic or any other lines. This entry was posted on Saturday, April 30th, 2016. You can follow any responses to this entry through the RSS 2.0 feed. You can skip to the end and leave a response.